I'm back from BEA and it was the most amazing experience. I HAD THE BEST TIME!!!! Of course, now I'm freaking out about everything I need to do both on the blog front and the home front! This is going to sound weird, but I am still flying high from getting to meet all my "fake" friends (as my husband refers to you guys.) At the same time, I am exhausted and sore from carrying so many books. Last night, I thought I'd crash, but I actually couldn't sleep because my mind is just racing! I don't want to bore you with lots of my trip details, but I'm just so excited! As many of you know, last Wednesday my grandmother fell down her cellar stairs and broke her leg in two places. Needless to say, that put a damper on my plans because I was so worried about her. In addition, I found myself scrambling around trying to find babysitting coverage for my kids just in case my parents had to rush to her side. Fortunately, there were no additional emergencies and my parents were able to watch my kids until my husband got home from his out-of-town business trip. I took the train up to Penn Station and it was terrific. It was my first time on a train and I loved it! I had over three hours of uninterrupted reading time -- you know how special that is when you're a mom. It's a good thing I read the entire time because I didn't pick up a book again for four days! I arrived at the Jacob Javits Center around 1:30 on Thursday and got the lay of the land. Since I have absolutely no sense of direction (just ask Dawn (aka She is Too Fond of Books) and Stephanie (aka The Written Word), I don't know how much I really absorbed, but it was fun just the same. This convention center is HUGE and the architecture is amazing -- lots of steel and glass. I immediately called Stephanie so I could meet up with her and Dawn. About an hour or so later, they arrived and I met my first "fake" friends. Let me tell you... these two women are amazing and even nicer and more fun in person. I am so lucky that we had a few hours together and could really just talk before things got crazy. The three of us first attended the Editors Buzz Panel where we heard about six "hot" new books that are coming out in the near future. I thought it was extremely interesting and I (of course) added some more books to my TBR list! Then, we headed over to the Opening Night Keynote where we got to see (get ready for it) Clarence Clemons and Steven Tyler!!!! Clarence Clemons played his saxophone for us which was very cool, and Steven Tyler actually sang a little song about the planets. I thought both of these men were extremely interesting and very entertaining! Then Dawn, Stephanie and I decided to take the bus to The New Yorker where we could meet up with Amy (aka My Friend Amy.) Since it was raining and Dawn was worried about keeping her books dry, she decided to take a clean trash bag out of the trash can at the Javits Center and wrap her books up in that. For some reason, the thought of Dawn walking around with her huge trash bag still brings a smile to my face. The bus wasn't coming quickly enough for the three of us so we cabbed it to the hotel. We got out of the cab and immediately started looking for Amy -- my roommate for the night. I could barely wait to meet her because I think she's such a terrific person. We all found her on the street in front of the hotel where there was lots of hugging! She is not only one of the sweetest people that I've ever met in my life, but she's also just adorable. Then we all headed to Arno's for dinner with Miriam, Valerie, Kelly, and Brianne from Hachette, Steph (aka Reviewer X),Lenore (aka Presenting Lenore) and more. Unfortunately, Trish's (aka Hey Lady!) and Jenn's (Jenn's Bookshelf) planes were both delayed so they didn't make it in time. It was so nice to meet all of these people and I think I can say that we all had a wonderful time. I don't know about Amy, but I had the best time talking with her Thursday night (into Friday morning.) We didn't fall asleep until 2:00 a.m. because we both had so much to say to each other (just one more thing...you know how it is.) We should have known better because we set the alarm for 4:00. We wanted an early start so we could head on over to BEA and get in line for tickets for the author signings! I hope I didn't bore you, but that was my Day 1. More to follow! 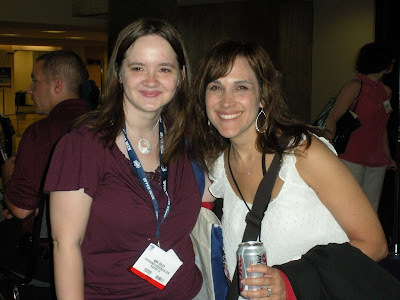 Kathy (aka Bermuda Onion) sent me this picture of Amy and me from Saturday at BEA. Amy looks adorable and I look very tired! I'm really not that short -- I'm just hunching over for the picture. Thanks for this great recap of your first day. Dinner sounds like it was a great time. Sorry I missed out on that one. I love the photo...I have to still develop mine...I took yesterday to recuperate. What a great recap of Day 1! I won't have a play-by-play until tomorrow! OMG! I had totally forgotten about the trash bag, must be trying to supress the memory. Really, people, it was a brand new empty/clean trash bag. I did whirl it over my shoulder to look like Santa (once). My number one highlight was meeting my imaginary friends!! Dawn: you must have looked great with that trash bag! Not boring at all. Thanks for sharing. Look at you gorgeous women! One thing is clear, BEA is action packed and clearly exhausting! Kudos to you for having the stamina to go..go..go and still get up the next morning early. I imagine there was quite a bit of adrenaline involved, no? You don't look tired! You look beautiful! It's sounds like you had a great time. Thanks for sharing your adventures with us. Hoping that your grandmother is doing better! You're so pretty... you look like Julia Roberts in this picture! I'm glad you had fun with Amy! Oh, now I really wish I hadn't missed day one! Great wrap-up and adorable pic of you and Amy! It was so great to meet you both! wow - I didn't realize BermudaOnionKathy was there, too?! what fun. I'm quite jealous! What a great photo! You and Am are very photogenic. It was great to meet you and to hang out although briefly. looking forward to doing it again. I second Kathy. It's impressive that you got this up so fast. I could barely post giveaway winners much less all of this. Great post! Can't wait for the rest of them! Absolutely loved meeting and chatting with you, too! Great wrap up! I'm so sorry we missed dinner Thursday night! Super recap. It was soooooo much fun to meet you and everyone else. I was so overwhelmed and I kept getting lost in the building too. I will learn to text more quickly before next year.